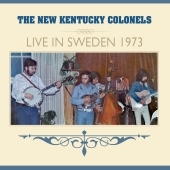 It’s been forty-three years in the making, but finally a complete recording of the New Kentucky Colonels’ Live in Sweden 1973 is available. Captured in two successive nights at the Mosebacke club in Stockholm, the 26-song CD showcases brothers Roland, Clarence, and Eric White and banjo master Alan Munde at their artistic peak. The 14-song edition of Live in Sweden 1973 that was released on vinyl by Rounder Records in 1976 has been an out-of-print collector’s item for many years. The tour that took the Colonels to Sweden reunited the White brothers, who had played in a family band throughout their formative years. Originally calling themselves the Country Boys, the Whites evolved into the Kentucky Colonels in the early '60s and toured the country electrifying audiences with their instrumental virtuosity, compelling rhythms, and traditional brother harmonies. They produced a highly acclaimed instrumental album, Appalachian swing, in 1964, and were recorded in many live performances which became part of the critical bluegrass literature for aspiring players. 'We had some great years touring in the sixties,' Roland recalls, 'but gigs got scarcer with the end of the folk boom, and by 1967 we all sought other work. 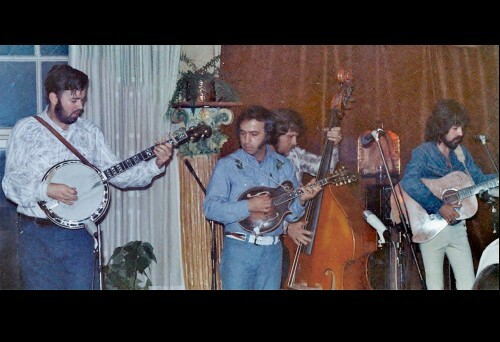 I went to Nashville to play guitar with Bill Monroe and his Blue Grass Boys. Clarence stayed in California, creating his own "country rock" style of electric guitar-playing and recording sessions with many artists. He joined, then toured and recorded with the Byrds. Eric also stayed in California and played sessions and bluegrass and country gigs. By the end of 1972, I had spent twenty-two months with Bill and then played mandolin in Lester Flatt’s Nashville Grass for four years. When Clarence called to say he had quit the Byrds and maybe we should join forces again, I was ready!' The European tour included the Netherlands, Sweden, Belgium, and England, and the band was planning more touring and recording. Tragically, less than two months after the Stockholm shows, Clarence was struck by a car and killed outside the Palmdale, California club where he and his brothers had just finished playing. These recordings reveal the White Brothers and Alan Munde at the top of their game, in an all-in effort, playing together with great verve and drive, a seemingly telepathic ensemble. The selections are a cornucopia of bluegrass, country, and folk songs and tunes, featuring Roland on mandolin, lead and tenor vocals; Clarence on guitar, lead and baritone vocals; Eric on bass and baritone vocals; and Alan Munde on banjo. The CD is on the Roland White Music label and is available at RolandWhite.com, Amazon.com, and all digital outlets. For more information or DJ copies, e-mail Diane Bouska. The songs: Fire on the mountain, Never ending song of love, Banjo boy chimes, Good woman’s love, Sally Goodin, Mocking banjo (Duelin’ banjos), Old Joe Clark, You won’t be satisfied that way, Shenandoah Valley breakdown, I’m blue, I’m lonesome, I know what it means to be lonesome, Blackberry blossom, Why you been gone so long, Alabama jubilee, Dark hollow, Take a whiff on me, Last thing on my mind, Soldier’s joy/Black Mountain rag, If you’re ever gonna love me, John Henry, The prisoner’s song, I am a pilgrim, Salty dog blues, New River train, Rawhide, and Roll in my sweet baby’s arms. BIB editor's note: Anyone looking for Christmas presents for guitar or mandolin players should make a priority of visiting the Roland White store page. PS: Two nice photos of Roland and the band on this tour can be seen on the Prescription Bluegrass Blog. Update 16 Dec.: See also this feature and review by John Lawless on Bluegrass Today, stressing the value of the recording for flat-pickers. With iTunes samples.